Maple Leafs head coach Mike Babcock could see halfway through training camp that Auston Matthews was ready to explode. Now the rest of the NHL is getting a first-hand look as the third-year centre tops the league with an eye-popping seven goals in four games. Maple Leafs head coach Mike Babcock could see halfway through training camp that Auston Matthews was ready to explode. "Matty's on another level," Babcock said at the time of Toronto's star centre. Now the rest of the NHL is getting a first-hand look. 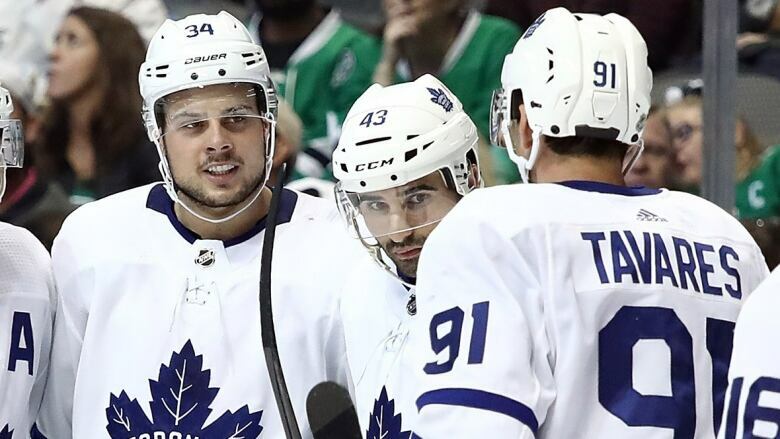 Matthews leads the league with an eye-popping seven goals through four games following consecutive run-and-gun road wins for the Leafs — 7-6 in overtime against Chicago on Sunday and Tuesday's 7-4 victory against Dallas. "I don't think it really surprises too many people," said Toronto winger Mitch Marner, who has also been lights out with two goals and six assists. Leafs teammate John Tavares sits second in the NHL with six goals heading into Wednesday's action, while defenceman Morgan Rielly (two goals, eight assists) is tied atop the points table with Matthews at 10. But Toronto and its NHL-high 20 goals is far from the only team involved in the early offensive deluge. The first week of the young season also saw Washington beat Boston 7-0, Pittsburgh down the Capitals 7-6 in overtime, Calgary get past Vancouver 7-4, Carolina top the New York Rangers 8-5 and San Jose thump Philadelphia 8-2. Eleven other games included at least seven goals, and it should be noted two-time defending Art Ross Trophy winner Connor McDavid and defensively-challenged Edmonton have played just once after starting the schedule in Europe. There could be a number of factors why, at least early on, many boxscores look like they belong in the 1980s rather than 2018. Players switching teams, new systems, coaches being less likely to match lines in October and further reductions to the size of goalie equipment have all been floated as possible reasons. And not to take away from the impressive offensive performances, but there have been some equally dreadful showings in the crease — see the final few minutes of Toronto-Chicago as Exhibit A. Through the first week of 2018-19, NHL teams have combined to average 6.41 goals in 41 games, compared to the 6.09 through the first week of last season (45 games) for a jump of nearly a third of a goal per outing. The first week of 2016-17, meanwhile, saw an average of 4.79 goals scored. Toronto opened last season with a 7-2 victory over Winnipeg before Chicago thumped Pittsburgh 10-1 to kick off a campaign that would end with more scoring — 5.94 goals per game — than any since 2005-06. The 2016-17 season, meanwhile, averaged 5.53 goals per game. It's a small sample size and teams will no doubt begin to shore up the defensive zone in the coming weeks and months. But even with the inevitable regression from the league's hot start, there's a good chance the 2018-19 season will see another recent offensive high-water mark. San Jose centre Joe Thornton was among a number of key players to go down with an early injury. The 39-year-old, who was limited to 47 games last season, is out with an infection that caused swelling in his surgically-repaired right knee. There's no timetable for Thornton's return after the club placed him on injured reserve. Florida goalie Roberto Luongo, meanwhile, was helped off the ice midway through his team's opener with a sprained medial collateral ligament in his right knee. Luongo, also 39, will be sidelined up to a month. Los Angeles netminder Jonathan Quick is on IR after suffering a lower-body injury, and Pittsburgh counterpart Matt Murray is out indefinitely with a concussion. Philadelphia also got some bad news, with winger James van Riemsdyk set to miss up to six weeks with a lower-body injury. It's only been two games, but maybe the pre-season predictions of another down year in Montreal were premature after the trade of captain Max Pacioretty to Vegas. The Canadiens outworked Toronto and deserved a better fate than the 3-2 overtime loss suffered in their opener before stunning the Penguins 5-1 in Pittsburgh. And it's not like Carey Price has stood on his head. The former Hart and Vezina Trophy winner, who missed significant time through injury in 2017-18, has been forced into just 44 stops through more than 120 minutes of action for a .917 save percentage and 1.98 goals-against average. Named captain before training camp, Justin Williams has already left a mark in the second season of his second stint with Carolina. Williams, who turned 37 last week, led a slow clap on the ice with his teammates after Sunday's 8-5 home victory over the Rangers. The players then skated two-thirds of the rink and playfully jumped up against the glass — mimicking rookie Andrei Svechnikov's celebration following his first NHL goal. The Hurricanes repeated the choreography in the wake of Tuesday's 5-3 win over Vancouver. "We wanted something so we can get together with the fans a little bit and connect," Williams said this week. "It was a nice little send off."